When you are working in a SharePoint world and there is team with you working on any site like developer tester and designer then – there is no chance for anyone to work directly on production server. When you have installed SharePoint there – you will have to setup UAT server, development server, production server and probably you can install staging server in order to streamline entire life cycle of SharePoint activities, if you are working on SharePoint production server and editing site or designing some SharePoint site directly from production so you will end up with the smoke if any error occurs then your site which is hosted on SharePoint will go down. So how anyone can be safe from this disaster. 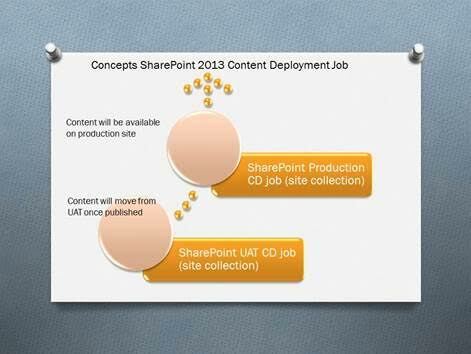 So there is concept of content deployment has been introduced in earlier version of SharePoint and now people have clear visibility about as to why they should setup all other server in SharePoint farm if really want to take advantage of content deployment job with SharePoint 2013.
specifying from where content will move – so in ideal scenario it would be from one site collection on UAT server to another site collection in production server. If you are ok with scripts then you can write scripts for exporting object to production site collection. If you have this status all the time with your job – and you don’t know the reason so you need to browse the log area of content deployment job – just click on that log file and open it. SharePoint Central Admin>> General Application Settings>> Configure Content Deployment Job>> check your job name there and click Failed >> and then browse the path mentioned for log there.